The new collection of videos and oral histories contains images of Canal sites that have disappeared. 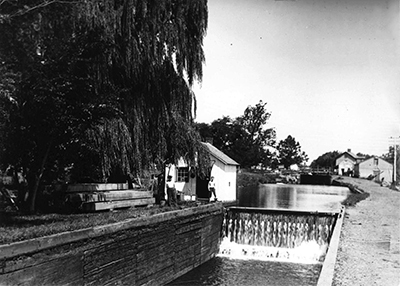 This John Anderson photograph shows Lock 10 in New Hope, which now is covered by South Main Street. 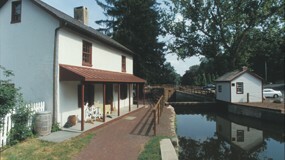 Films of the Delaware Canal during the first half of the 20th century and interviews with men and women who worked on the Canal are available thanks to the efforts of the Solebury Township Historical Society and the cooperation of the National Canal Museum in Easton. 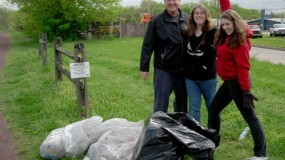 Two members of the Society, who are also dedicated members of the Friends of the Delaware Canal, collaborated with the National Canal Museum to preserve the Museum’s cassette and film collection. Robert McEwan, Society Vice President and archivist, and Elizabeth Carrick, the Society’s web consultant, have devoted a tremendous number of hours to evaluating the collection and publishing the best video and oral histories on the Solebury Township Historical Society website.